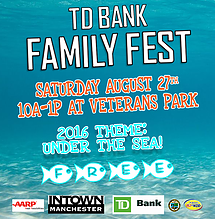 Bring the whole family and join this free festival as Intown Manchester and TD Bank bring us the 4th Family Fest this Saturday, August 27, 2016. This year, the theme will be “Under the Sea” which the kids will surely enjoy. There will be a lot of fun activities, crafts, healthy snack and more from many different local businesses and organizations. Many interactive on-stage performances will be held the whole day! This free festivity will be held in Downtown Manchester at beautiful Veterans Park located at 700 Elm Street, Manchester, NH from 10:00am to 1:00pm. TD Bank, AARP, WZID, The City of Manchester, and Families in Transition are the event sponsors.